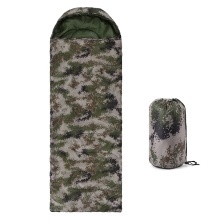 Water repellent polyester sleeping bag great for outdoor camping, hiking, backpacking and climbing. Ultra light and foldable to pack in a bag for easy and convenient carry and transport. Warm: 10.5oz hollow cotton lining, great bulkiness and thermal insulation property to keep your warm in cold days. Comfortable: Skin friendly polyester, roomy space for free turn over and put your pillow in the hood for all round warmth keeping. Convenient: Wind block zipper open for easy operation and a fastener tape prevent unzip during sleeping. Lightweight & Portable: Only 2.0lb after packed in the storage bag, super lightweight and convenient to storage and transport. Temperature: Cozy for 5-15°C, great for spring, summer and autumn.